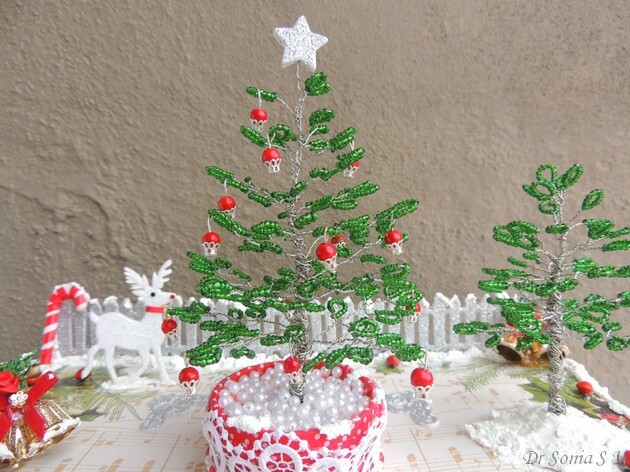 Dear friends Thank you so much for the support on the Beaded Christmas Tree diorama.Thrilled to say it came top 3 in 3 separate challenges! This is yet another handmade Christmas tree project! I had earlier posted a DIY photo frame set with a star shaped box.So many of you asked for a tutorial to the star box…that was nearly a year ago! 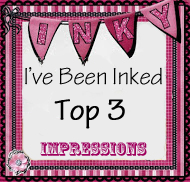 !Well finally I got around to writing up a tutorial for the star shaped box! I stacked 5 star shaped boxes [packed with little gifts of course! ]to make a Christmas tree. 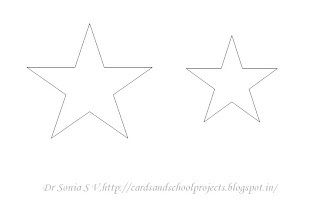 Stars-You need a star template – Hand cut,Punch or Die cut 4 stars. You can either make all 4 stars the same size or cut out 2 stars to be slightly larger in size [will show you why soon]. You need 2 card strips to make the base and lid of your star box. The length of your card strip will be 10 times the side length of your star + 1/2 inch. Width depends on how high you want your star boxes to be.I kept mine 1 inch high and so my card strip was 1 inch + 1/4 inch for tabs. 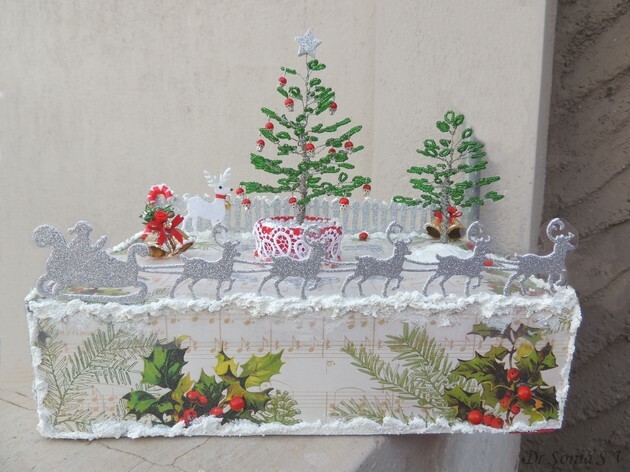 Optional Decorative strip – optionally use pattern paper,ribbon,lace or washi tape to decorate your boxes. I used a strip of pattern paper 1 inch wide to wrap around my star box. Score [mark deeply with a blunt pen or bone folder] and accordion fold your card strip as shown above at intervals equal to the length of your star side.You’ll need to make 10 “sides” plus a 1/2 inch tab for gluing. At the accordion fold lines on the 1/4 inch part of the strip you had earlier scored off ,snip off triangles.You will create gluing tabs to help adhere the card strip to your star . Fold these gluing tab wedges at 90 degrees. Apply glue on the gluing tabs one by one and stick under a star to snugly fit along the side of a star. Keep gluing all your tabs one by one.Spend some time to make sure each tab adheres well to your star otherwise your box will fall apart and you’ll be cursing in despair! The final 1/2 inch glue tab on your card strip can be stuck either inside or outside the star box.If you are going to use pattern paper to line the outside of your star box stick the tab outside as the pattern paper will hide it. This is how the under surface of your star box will look once all the tabs are glued.You can adhere a same size or a slightly bigger star atop it. To line your star base with pattern paper simply apply glue and wrap it around creasing along the points as you go along with your nails to keep the star points sharp and crisp! Here are the 3 sizes of star shaped boxes and their lids.Well how do you make the lid you may be wondering! That is the best part…you can make it in exactly the same way using the same dimensions! The star shape allows a lot of leeway and you can manipulate 2 similar sized star bases to make one the base and one the lid of your star box. So you don't actually have to break your head calculating how many millimetres more to make the lid! Here is a close-up photo of the lid of my star shaped box.In these boxes I glued a star of slightly larger size on the basic star box.Using a larger size star adds a bit of extra dimension and also serve the practical purpose of making your boxes easier to open! 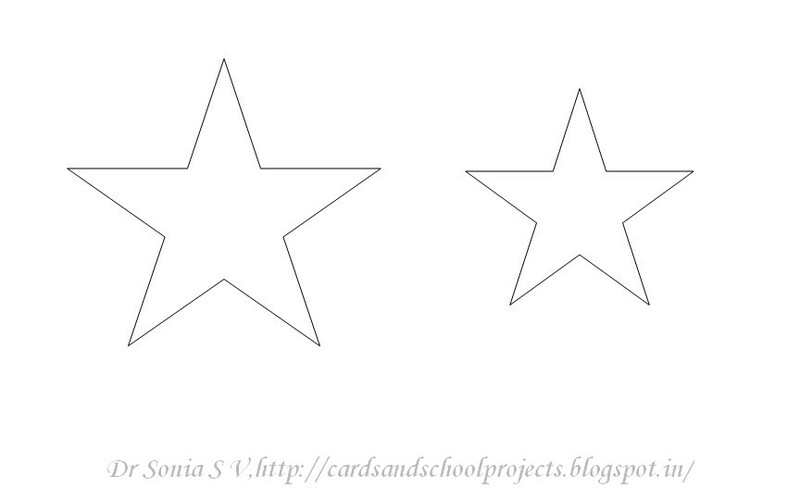 If you want to handcut your stars you can use this stacked stars template. In the picture below you can see the smallest star box serving as the base of my Star Box Christmas tree. 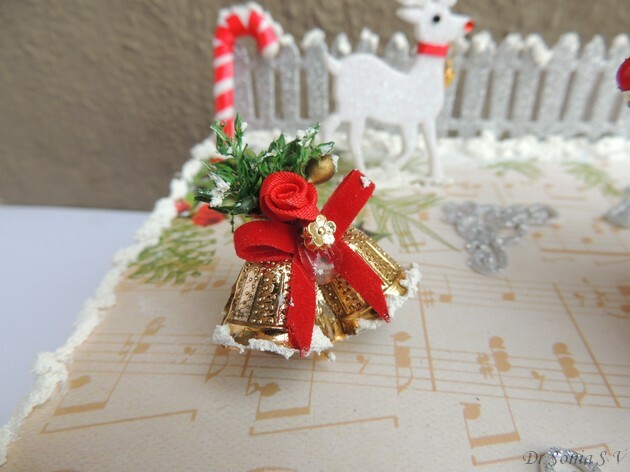 I used lots of tiny star shaped brass beads on my boxes in keeping with the starry festive theme!I placed my Christmas tree on lacy heart Spellbinder die cuts [I love this die and you can see more in my Foam jewellery tutorial ]and also placed a lacy heart atop my Star Box christmas tree . Made the wooden bead -cloth doll into a fairy by gluing on feather wings and a shimmery flower and pearl beads to her waist. I hope you liked this tutorial to make a star shaped box.Apart from serving as a gift box and decor piece you can use your star box as a shadow box [use an OHP to make the lid ]or even personalise it to showcase a favorite photo. Dont forget to participate in the Lulupu Bloghop — 2 lucky people who leave comments along the hop will win some amazing prizes + 1 lucky hopper can win a Martha Stewart punch from Lulupu! 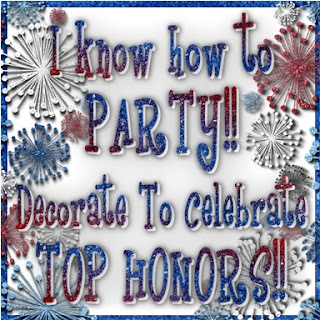 Thank you so much Karuna for inviting me to be part of your awesome celebration. 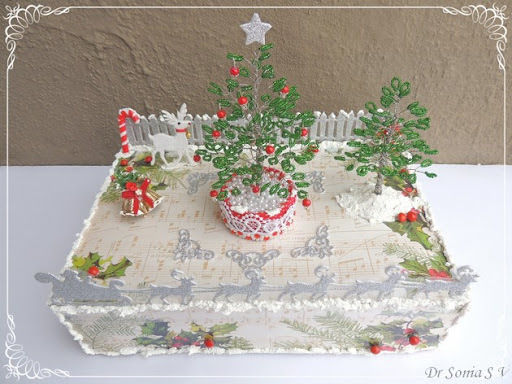 Dear friends Thank you so much for the wonderful support on my beaded trees diorama.I love to work with foam and foam crafts seem to be very popular nowadays . The best thing about foam is you can crush it ,bend it and even squish it without damaging it! Its washable too and so easy to cut. Sharing how I made some fun jewellery using foam . Make your foam rose with thin foam using either Foam rose tutorial 1 or Foam rose tutorial 2.Make a calyx from thin green foam and attach it to your foam rose. Use something [I used a metal wire stick] to pierce a hole a few millimetres from the edge of your foam shape. Insert a jewellery ring into the hole. 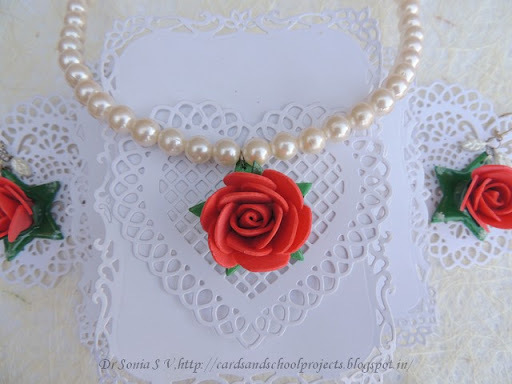 Use the glue gun to stick your foam rose to the base and your Foam rose pendant is ready. I added a generous layer of glossy accents to give a plastic like shine to my foam pendant! 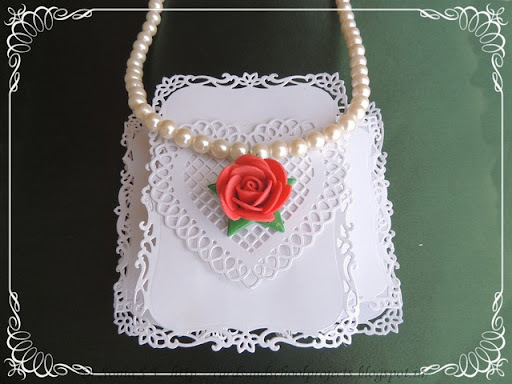 Make a foam rose pendant as above and attach to an earring finding using more rings.I added pearly leaf danglers using head pins. I added “diamond dust” to the tips of the star base of the Foam rose earrings. Cut a strip of foam [use thick variety foam] as long as you want your bracelet to be [find the length by wrapping loosely around your/ daughter’s wrist] . Cut a piece of lace 2 inches longer than your foam strip.Stick the foam strip to the centre of the lace using the glue gun.Turn over and glue the excess lace to the back of the foam. Pierce the edge of the foam strips and add jump ring to one end and a clasp to the other end. If you wish you can use modpodge to get a seal over your lace bracelet. 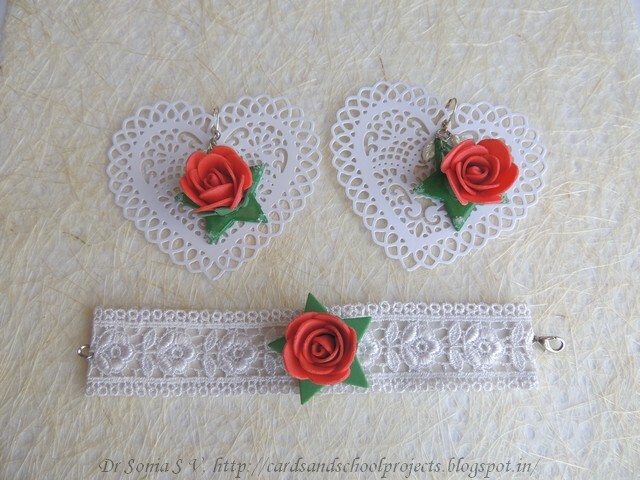 Since this foam jewelry set is a handmade gift -for a bit of added glamour I hung the earrings on lacy hearts cut with Spellbinder dies. 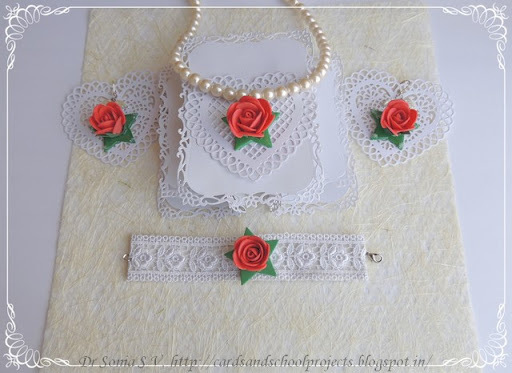 I hope you liked this easy foam jewelry tutorial. Dear friends Thank you so much for the wonderfully uplifting comments on my Beaded tree tutorial.I used the beaded trees to make a Christmas diorama by recycling an old cardboard box.Wrapped the box in festive papers and added a glittery Santa in a sleigh pulled by reindeer ploughing through snow! The red berries on the holly leaves strewn all over my Christmas diorama are called “manjadi kuru” in my native malayalam language.A little bit of snow really jazzed up this old Christmas bell ornament I had. Many friends commented in my earlier post that the beaded trees must have taken time to make ..actually I was surprised that they took much less time than some cards!! The photo above captures the shimmering magical glitter of Santa and his reindeer! Supplies : Dies: Spellbinder Lacy heart,Sizzix Santa and reindeer,Sizzix star ,Beads, Wire , wire cutter,head pins, flower caps,White foam reindeer,Pattern Paper- from Itsy Bitsy;Marriane fenceDie -Priya’s Craft shop; Snowtex –Lulupu. 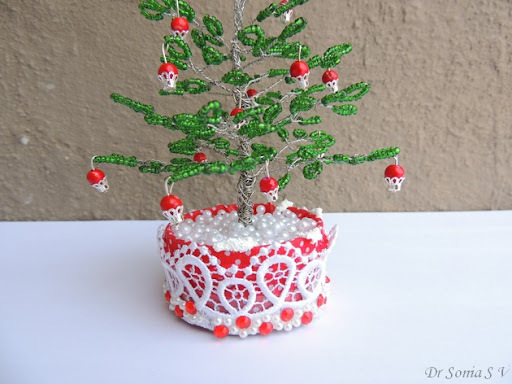 Dear friends, my 7 year old daughter is rather taken with beads these days and is forever making necklaces and bracelets [see her Beaded Necklace]..I caught the beading fever from her and tried to make a beaded tree using some seed beads I have had like since forever! 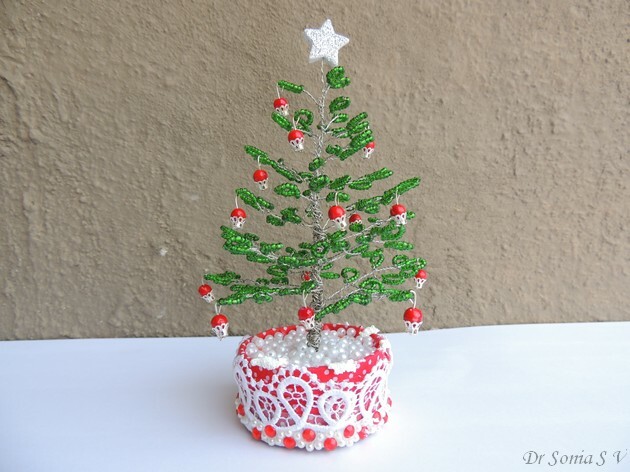 This beaded tree is quite simple and quick to put together ! Some of the leafy branches were made by my 7 year old and it took just approximately 1 hour to make the unadorned beaded tree! Wire -24 G or even thicker ones [of less gauge]– I worked with 24 G and it was quite easy to twist and bend. Thread 10 to 12 seed beads on the wire.. you don't have to count but eyeball the length of the beaded area.The commonly available seed beads [unless you buy high quality expensive ones] generally vary in length in one packet and if you thread the same number of beads the length will vary . 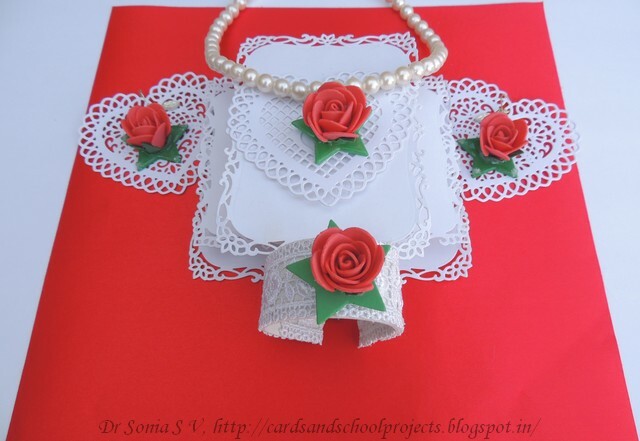 Cross the wires and twist to form a loop of the seed beads.Keep twisting to give the beaded “leaf” a stem. Make your stem as long as you want. Bend the wire at the length you want the leaf to branch out and holding the beads in your hand twist to form a looped leaf like before.Keep twisting till the wire reaches the earlier leaf’s stem. Twist the 2 arms of the wire to a length you want . If you want add more leaves on each arm of the wire as before. You can make a conical “Christmas tree” type of tree by adding leafy branches of different stem lengths and having different number of leaves.You can make three or four “2 leaf” branches and add them to your 3 leaved top branch. Decide how much down the top branch you want the next layer of branches and twist on the leafy branches one by one . So your tree is already shaping up! Add branches with more leaves or longer stems as you go down the tree trunk.There is no hard and fast rule on lengths and number of leaves on how to make your tree..I experimented quite a bit and my tree turned out different every time and it was fun! 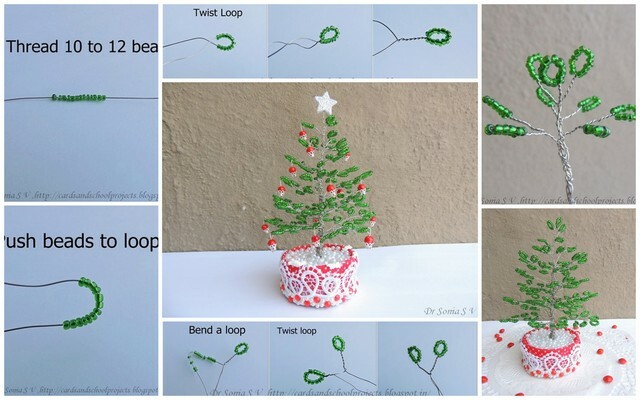 You can make a loopy base for your tree with wire [rather tricky !] or insert your tree trunk in play dough/clay like I have done here. The base of my beaded tree is a plastic play dough container which I dressed up with washi tape, lace and rhinestones.To cover up the play dough I poured a generous amount of white glue over it and covered it with pearls.Can you see the "snow" on the rim of my tree base? Threaded a flower head and a red bead on a pin head and looped them on my beaded tree.I don't know if they look like cherries or Christmas tree ornaments! Die cut 2 stars from silver glittery foam and stuck a loop of wire between them.Twisted the star atop the beaded Christmas tree. 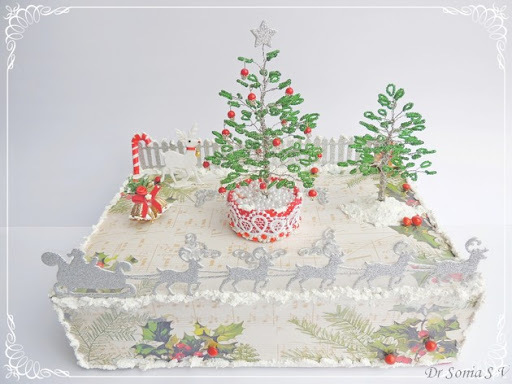 Click here for the full view and details of the snowy Christmas Diorama I used the beaded trees on . Do tell me how this simple tutorial was. Supplies :Beads, Wire , wire cutter,head pins, flower caps,pearls,Rhinestones-Itsy Bitsy. 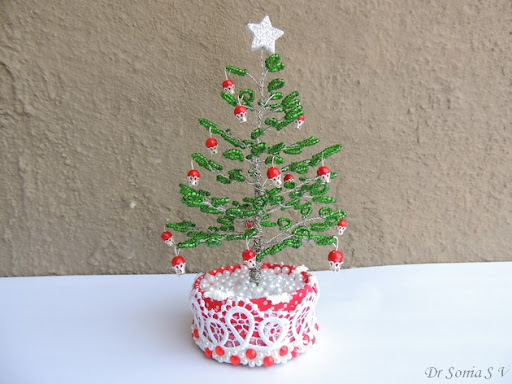 Edited : This beaded tree tutorial was featured at Totally Tutorials!